Interview with Sarah Roper over afternoon tea. Oboe position in the Orquesta Ciudad de Granada, Spain 1995-1996. She has performed and recorded as Principal Oboe with Klangforum, Vienna and orchestras in Spain, Germany, New Zealand ( Associate Oboe, Auckland Philharmonia 2008-2009) and the UK (BBC Philharmonic, Halle Orchestra and the Royal Scottish National Orchestra). MeSaMor which perform regularly in festivals throughout Spain. As a recitalist and soloist with orchestras, Sarah has appeared in the UK, Austria, Germany, Spain, Italy, Hungary, Czech Republic, Japan, USA and New Zealand. In 2013 Sarah gave solo recitals during the Monteverdi Oboe Festival in Bolzano, Italy, and the Spanish Double Reed Society, Asociación de Fagotistas y Oboístas de España (AFOES), Conference in Madrid. She also performed solo recitals during the International Double Reed Society (IDRS) Conferences 2012 Ohio, 2015 Tokyo and 2014 New York, where she served on the jury of the “Young Artist Competition”. Stuttgart and the Royal Academy of Music in London. 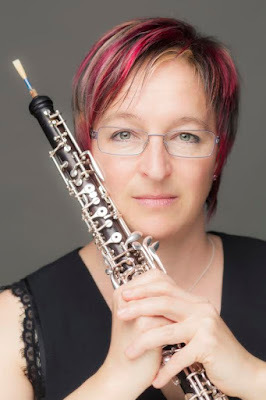 She collaborates with local youth orchestras such as the Youth Orchestra of South Spain (OJA) and has written articles for the British Double Reed Society, IDRS and AFOES magazines. She is a founding member of the Seville Double Reed Society, Asociación de Doble Caña de Sevilla, holds the International Relations post in AFOES and has recently been appointed as Second Vice President of the IDRS. Sarah is an Associate of the Royal Academy of Music. She plays a Howarth of London oboe.